Let’s be honest here: Being a woman is just so darn expensive! Our beauty regimen can get quite costly and my all-natural beauty wants & needs are becoming addictive! But our beauty product routine is not something that we women can just quit cold-turkey. I’ve never seen a pack of gum to lessen my desire for anti-aging foundations, powders, and bronzers, and I’ve never been able to find a “reduce-the-cravings-for-mascara-patch.” All in all, I don’t think that we women should ever have to cut back or give up our special girl-things that make us look and feel good. But I do, however, think we need to be a little more creative and think outside the box with new solutions for inexpensive beauty alternatives. So, how can we save some serious cash-flow and still feel ultra-glamorous? Two words, my friends: Virtual Makeup. Yes, physical makeup is so overrated! What really counts is looking great in our photos. We may slap on a pair of old jeans and beach sandals to go to grab a bite to eat and run a few errands, but do we post these casual, greasy hair-in-a-ponytail and no makeup photos on our Myspace or Facebook profile? No way! Only our best looking mug-shots end up being the sacred Profile Pic! With all the ex-boyfriends and old competitive girlfriends out there in social networking cyber space, there’s no chance we’ll upload our every-day, sweats, T-shirt, and a few zits pics! But with virtual makeup, we can save money and transform our regular pics into gorgeous, professional-looking head shots! Virtual makeup allows us to make easy, natural-looking edits to our photos, so that we can whiten our teeth, remove pimples, get rid of wrinkles, airbrush photos and look ultra-fabulous for pennies! 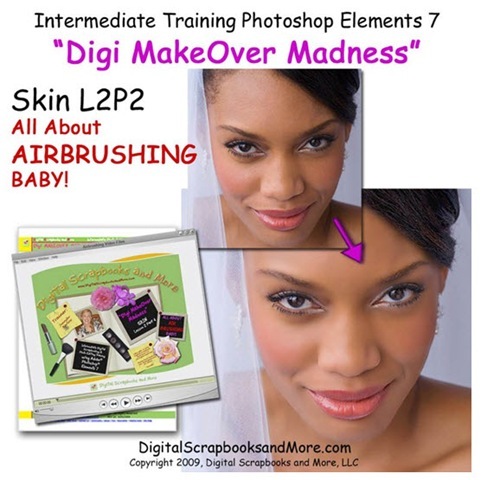 Digital Scrapbooks and More (www.DigitalScrapbooksandMore.com) makes instantly downloadable photo editing training that specifically focuses on virtual makeup, called the Digi MakeOver Madness Tutorials (www.shop.DigitalScrapbooksandMore.com). The Digi MakeOver Madness Tutorials has a simple motto; a philosophy that I think we can all appreciate: “Spend $5… look like $500.” It’s true, as each individual tutorial is ridiculously inexpensive at $1.99 or less, and features super-easy training to make your favorite photos look even better. Convert photos to vintage black & white pics, whiten teeth, get rid of blemishes and wrinkles, digi tan, even airbrush photos (celebrity or not)! And although Digital Scrapbooks and More cannot legally make any guarantees, I wouldn’t be surprised if I made several new random Facebook friends after posting my newly edited pic. So what if you’re worried that you don’t have photo editing software to follow along with the training in order to apply virtual makeup to your own photos? Don’t despair; you can get a FREE 30-Day Trial of Photoshop or Photoshop Elements through the Adobe website (www.Adobe.com). With no hidden tricks or gimmicks, you really, truly can get picture-perfect pretty with nothing but pocket change. I have been to your site several times now, and this time I am adding it to my bookmarks 🙂 Your pages are always relevant, unlike the same-old stuff on other sites (which are coming off my bookmarks!) Keep it up!